While Google Voice is still an invite-only service, Google has gone out of their way to reach out to a variety of audiences. Late last year, Google offered all active military personnel access to their service. Today, they are targeting a new demographic, students. 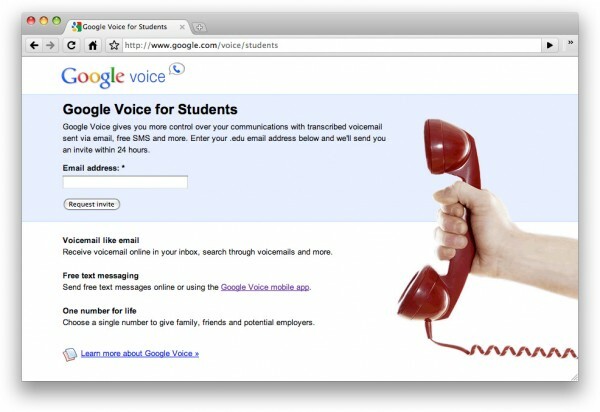 Anyone with a ‘.edu’ email in the United States can request a free invite from google.com/voice/students and expect full access within 24 hours. For those that haven’t heard of Google Voice, the service provides a free second phone number for your existing phones. Voicemails left at the new number are automatically sent to a users email inbox with voice-to-text transcriptions. The mobile Android App and web page even offers unlimited free SMS. Other neat features include the ability to set custom greetings, block calls, record conversations, host conference calls, and even screen unknown calls. Google also has competitive international calling rates. If that is too overwhelming, the Google Voice YouTube Channel offers a great overview of the entire service and walk-through videos for specific features. There’s no saying how long the service will remain entirely free. Even if you don’t plan on using Google Voice anytime soon, it’s a good idea to sign up if there’s a slim chance that you may some time in the future. If you aren’t happy with the service, one check box will disable it entirely.